The heat-fixed specimen can be stained using regular (non-toxic) ink. The ink is then carefully rinsed off with water. School microscopes are often not equipped with phase contrast optics, which would be suitable for viewing bacteria. It is possible to see bacteria also in regular bright field, but the results are better if they are stained. Yogurt bacteria are safe for the use in schools. Suspend a small amount of yogurt (tip of a knife) in a few ml of water. Spread a drop of this suspension on a slide and let it dry completely at room temperature. Be patent here, do not accelerate the drying process by heating the slide. Briefly place the dry (!) slide on the hot plate with the bacteria facing the top. If you “boil” the bacteria, then they may pop open and lose their shape, and will not accept the stain. So make sure that all the water is gone before heat-fixing. Remove the slide. You should be just able to place the slide on your palm without burning yourself. If it hurts (or if you burn yourself) then the slide was heated too much and you have to retry and place a new suspension on the slide to dry. In this case the bacteria were burned and may have lost their shape. The heat treatment fixes the bacteria to the slide, so that they will not be washed off. In microbiological labs, the heat fixing process is usually conducted with a gas burner, but this may be too dangerous for schools. Place a drop of ink on the specimen and wait for about 10 minutes. Carefully rinse the ink off by slowly pouring water or alcohol (depending on ink) over the slide. Continue this washing step until no more ink is given off, but do not over-wash. Also do not pour the washing liquid directly over the bacteria, but rather let it flow over it. If the bacteria are observed with oil immersion, then it is not necessary to place a cover glass on top of the sample. Instead place a drop of oil directly on the stained bacteria. This is only for experienced students, there is the danger that the wrong objectives are rotated into the oil…. The safest method would be to use water and a cover glass and to start observation with the low magnification objectives (In this case, of course, it is not necessary to let the slide dry after the washing). Method 2: this method is easier and does not need a heat-fixing step. Take a knife tip of yogurt and directly add 1-2 drops of water-based blue fountain pen ink. Do not use calligraphy ink. 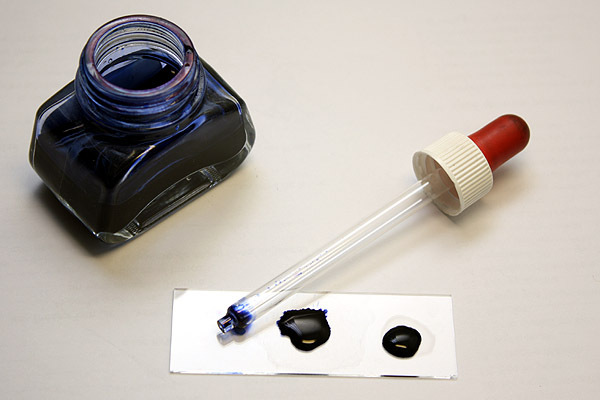 This type of ink is composed of suspended ink particles which can not be taken up by the bacteria. There is no need for a washing step. The bacteria will accumulate the ink and will become darker than the surrounding medium. Take a small drop and place on the slide for microscopic investigation. The drop has to be sufficiently small to form a very thin film between the slide and cover glass. You should be able to see blue clusters of bacteria. Individual bacteria are probably too small to show a blue stain, but the diffraction pattern should make them visible. Some clusters may not have taken up the ink. The ability to take up the ink may be an indicator if the bacteria are still alive. Different types of inks contain different substances that may be more or less suitable for staining. I recommend you to experiment. The teacher could also try to dissolve some black or blue marker ink in some alcohol and then use this solution for staining. Inks used for calligraphy will most certainly not work. They contain suspended particles (carbon?) which are not able to enter the cells. Also be careful when using commercial stains. Some of them are designed to stain DNA and this is then not suitable for the use in schools (carcinogenic) – read the instructions that accompany the stain. If you use ink which is soluble in alcohol, then you may need to include a (brief) washing step with alcohol to remove excess ink. Experiment first. Problem: The unstained bacteria are not visible. Solution: They are transparent, close the condenser aperture diaphragm all the way. You will then see diffraction patterns around the bacteria. Problem: You see a blue mass but not individual cells. Solution 1: The suspension was to dense. Dilute the suspension with more water, or if you directly observe the yogurt, make the drop smaller. Solution 2: Remove more ink by rinsing longer.